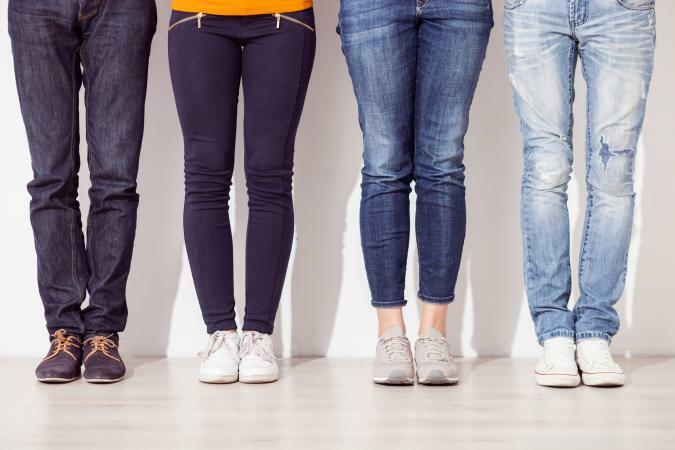 Choosing the right shoes to wear with skinny jeans depends almost as much on the season as it does on what actually works. 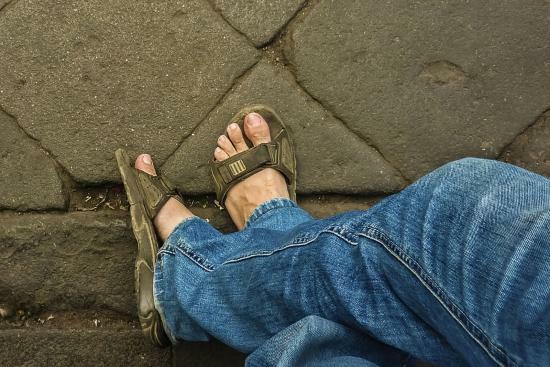 Plenty of shoes work well with skinny jeans for men and women, but the best choices tend to be at opposite ends of the shoe spectrum - from flip flops to boots. One basic rule is to wear shoes you want to show off. Unlike with other jean styles, you won't have just the toe and/or heel of your shoe showing; almost the whole shoe will be on display. For women wondering which shoe styles will work best with their skinny jeans, the range of options are practically limitless. Regardless of your heel or shoe preference, whether for relaxing in comfort or dressing up, selecting the right shoe to complement your outfit and jean length can be accomplished with any of the following styles. Flats work best for those with small feet because the tight jeans accentuate the length of the shoe and there's no heel to break up the horizontal line of the foot. Moccasins, such as the cozy styles from Minnetonka, are warm and comfy for the wintertime. They can be worn with both dark and light denim as the brown shade goes with all shades of blue. A classic moosehide pair is available for about $70 and comes in sizes 5-11. Slip on loafers have become extremely popular. This Sole Society Louise Et Cie loafer is an adorable option, coming in at around $130 and available in sizes 6-10. They can be paired with light or dark denim, and are a great alternative to ballet flats. 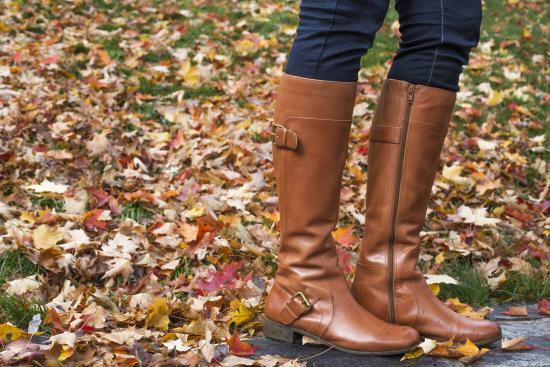 Boots look great pulled on over your skinny jeans or worn with cuffed skinnies. All boot lengths work with skinny jeans, from ankle to over-the-knee styles. Rain boots are great with skinnies to keep your feet dry during the rainy season or even on snowy days. Hunter boots (like the original Hunter tall boots, about $150 and available in sizes 5-11) are the perfect staple rain boots, but stores like Target also offer rain boots at a lower price point. For extra warmth, layer boot shoes under your boots. Ankle boots work well with cuffed jeans. A popular version is by Sam Edelman (the Petty bootie; $130 and available in sizes 6-12). Try a lighter shade ankle boot paired with darker denim for a cool contrast. Over-the-knee boots worn with skinny jeans can make legs appear sleek and add a hint of attitude to your outfit. For a fit that will not be bulky, look for a pair that stretches over the legs such as these CHARLES by Charles David Giza Over-The-Knee stretch boots (about $140, available in sizes 5-11). Neutral pointed-toe toe pumps, like Ann Taylor's Mila Leather Pumps (about $130 and in sizes 5-11). They streamline the leg even further with their slightly pointed shape but are also classic for everyday wear. Colorful strappy stilettos, like Sam Edelman's Patti Ankle Strap ($70 and available in sizes 5 1/2 - 10 1/2). The bright color pops against a dark pair of denim. They don't always have to be brightly colored heels, but an unexpected strap or jewel can spice up your look, even if you're using a dark shoe paired with dark wash jeans to give the illusion of even longer legs. 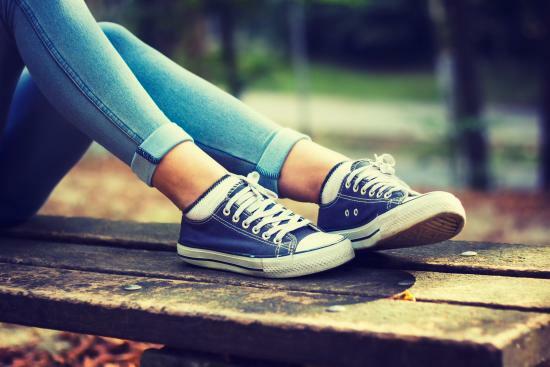 The ultimate in comfort, sneakers are a great casual shoe choice to pair with your skinny jeans. Converse sneakers come in many colors and patterns, and you can even lace them up in a variety of cool ways. The skinny jeans won't cover up your great taste and shoe lacing skills. A basic black and white pair comes in at $50 and is available in sizes 5-11. Keds are also a good option for a more feminine take on sneakers. The brand often collaborates with celebrities, designers, and other influencers to create fun, lively color, print and metallic styles. Many of the sneakers range from about $55 to $90 and come in sizes 5-11. Leave last year's beachwear at home, but don't forget about your fun sandals for a quick go-to casual shoe style when you're running out running errands or having a low-key day. As long as your pants aren't so long that you need heels of some kind, there's no reason to skip over your sandal collection. Gladiator sandals have a touch of rebelliousness, mixed with a feminine edge that many women are drawn to each season. The intricate caged design of gladiators pair perfectly with skinny jeans. For a retro-vibe style, try these See by Chloe gladiator lace-up sandals, for around $355. They are available in sizes 5-10. Havaianas flip flops are available in a huge variety of colors and are made from durable rubber. These are perfect for the beach and can be worn out on casual days. A basic pair is available for under $30 and available in sizes 5-12. Rainbow brand sandals are another great option for warm-weather wear and are extremely comfortable. The women's cute Avalon T-Strap sandals are about $60 and are available in sizes 6-11. Embellished flip flops are perfect for when you want to have a subtle glammed up vibe while laid back. For a touch of sparkle while taking it easy on vacation, these Fitflop Cha Cha thong sandals provide comfort and style for around $70 and come in sizes 5-11. Wedge flip flops are ideal for the women wearing skinny jeans who wants a bit of a lift, while presenting a carefree style. The Cobian Women's Chloe Zoe wedge costs under $25 and comes in sizes 6-10. For men who either want to create a refined and dressed up skinny jean look or one that is relaxed and leisure, choosing the right pair of shoes can take your style in any outfit direction you want. 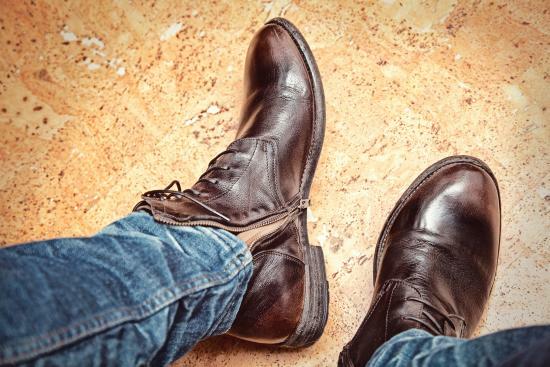 Whether going for a look that is clean and dapper or casual and clean, wearing a pair of slip in or lace up shoes with your skinny jeans is a great choice. Going for a preppy look with a plaid shirt and skinny jeans calls for a sleek pair of loafers. The original penny loafer brand G. H. Bass has a style called the Larson Weejuns for around $110, available in sizes 7-13. It is a neutral shoe style that can be paired with many colors or prints. Whether you are dining out with friends or having a casual dinner with your significant other's parents, putting forth an effort requires a simple pair of lace-ups. The Alpine Swiss Beau Men's Dress lace up oxford is a casual choice that has a stylish wing-tip brogue and is made with genuine suede. It comes in sizes 7-11 for about $40. Setting an athleisure tone with a pair of skinny jeans has no limits, but determining whether you want an outfit that says skateboard cool or city hipster depends on your sneakers. Canvas sneakers, such as the Slip-On Lite style by Vans for about $55, (which come in sizes 7-13) are great for vacation or a walk around the town. Layering up your skinny jeans with a vest and hoodie? Consider a classic pair of high tops, such as the Pro Model sneakers by Adidas for about $90. This style comes in sizes 4-14. If you are going for a look that says European dapper consider combat boots that are polished and clean, such as these Steve Madden Troopa boots. These workman boots cost about $80, and come in sizes 5-11. Clarks provide comfortable high-quality craftsmanship in several designs, including the original Wallabee boot for around $180. If the soles of Wallabees are too chunky, the Desert boot for around $140 might be more to your liking. Clarks shoes are available in sizes 7-13. Whether taking it easy on the weekends or on vacation, flip flops and skinny jeans are a laid-back style match made in heaven. The Reef Fanning, available for around $55, is a simple yet stylish option available in sizes 4-17. Birkenstocks have vintage appeal, yet are modern to keep a comfortable skinny jean look up to par. The Arizona style has that classic appeal in cool neutrals like Mocha or Stone, and is available in sizes 7-15 for about $100. If you thought that skinny jeans are limited to the skater crowd or winter days that require boots for extra warmth, think again. 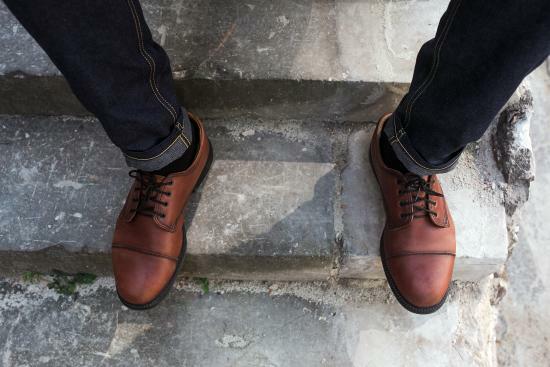 You just have to know which shoes to pair with them to enjoy wearing skinny jeans year-round. Wear them with almost any shoe you like; just make sure they are shoes you want to show off and that your jeans are the proper length for the type of shoe you've chosen.